Why is Slip, Trip and Fall Prevention Important? In Canada, over 42,000 workers per year are injured due to fall accidents! Service Hospitality is committed to helping you make your organization an injury-free workplace. As part of our ongoing commitment, we have developed this self-guided information package to help you minimize, and eventually eliminate the injuries caused by slips, trips, and falls. -The average age of the people being injured by falls is 41.6 years old. This is older than the average age of all injuries in the industry, which is 36. -The average cost per claim is more than 50% higher for slip, trip, and fall claims than for the average injury claim in the service & hospitality industries. 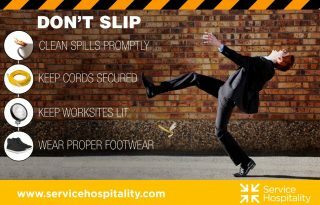 Slips, trips & falls can occur in any workplace. Approximately 60,000 Canadian workers are injured each year due to slip, trip and fall injuries. This course will explain the common cause for these types of injuries and what preventative measure can be taken to reduce the rise of these kinds of injuries in the workplace. Contains a pocket card with the 3 worker’s rights! As you watch the video in the link above, think of ways you can work with your employees to create a workplace environment that eliminates the risks of slips, trips and falls. You may wish to encourage them to discuss incidents or near misses, what could have been done to prevent them, and what’s being done now to prevent re-occurrences. 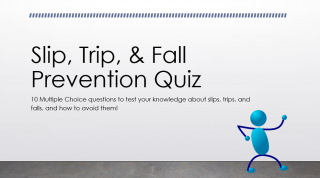 In this activity, you will be provided with 10 multiple choice questions to test your knowledge about slips, trips and falls, and how to avoid them!